Railpictures.ca - Bill Thomson Photo: CPR 136, 815 and 1057 lead the famed triple header steam excursion of May 1st 1960, putting on an impressive smoke show heading through Erindale (Mississauga) near Mavis Road. | Railpictures.ca – Canadian Railway Photography – photographie ferroviaire Canadienne. 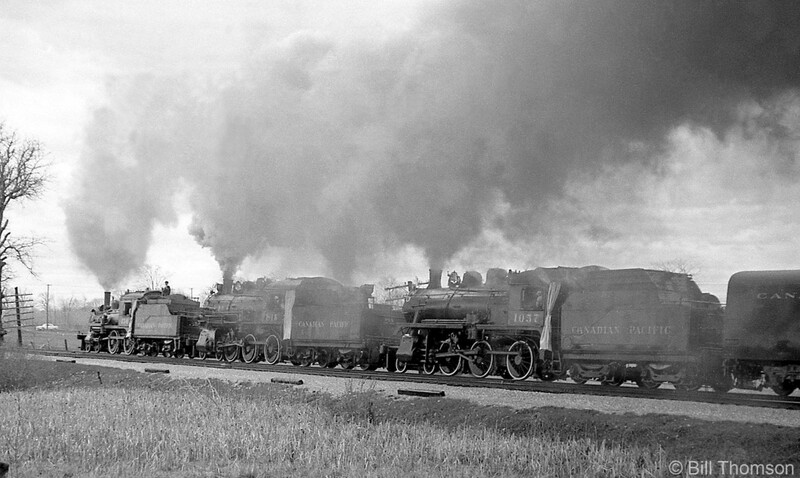 Caption: CPR 136, 815 and 1057 lead the famed triple header steam excursion of May 1st 1960, putting on an impressive smoke show heading through Erindale (Mississauga) near Mavis Road. 136 and 1057 survived. Did 815 survive or get the torch? In 1960 the Mavis Road area was considered Cooksville – but that is a minor quibble about a wonderful picture. Bravo Bill! I lived on Dundas Highway near Erindale Station Road at that time. I don’t recall my Dad taking me to the crossing to see the steam train. I’m sure I would have remembered a triple header like that.